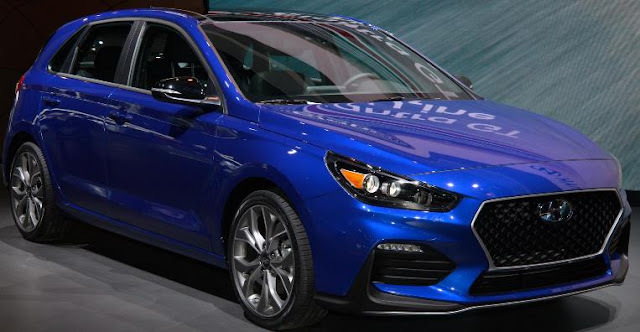 The new 2019 Hyundai Elantra GT N Line trim, the first N Line model for the United States from Hyundai, is powered by a 201 horsepower 1.6-liter turbocharged-GDI engine with six-speed manual transmission or an optional seven-speed DCT with larger steering wheel mounted paddle shifters. The Elantra GT N Line models available features include Smart Cruise Control with start/stop capability, Forward Collision-Avoidance Assist, High Beam Assist, Lane Keep Assist, Driver Attention Warning, and AVN 5.0 infotainment system with an eight-inch screen. The new 2019 Hyundai Elantra GT N starts at $24,185 (including $885 freight charges).